Hypnotized the world? Allah awaken the people? This is a representative in the Congress of the United States of America. Invoking the name of Allah and claiming that the Jews have beguiled the world and blinded us to their evil. The tweet, sent in response to Israel’s military reaction to attacks by Hamas, backed an identified terrorist group. She is a nut. Israel represents the vanguard of civilization in the middle east. Pressed from three sides by hostile Arab countries. She stands, back against the sea and enduring hostility from the day she was established by British fiat in the ’40s. 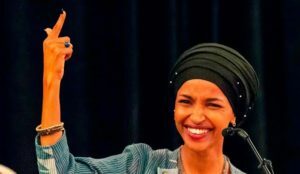 The Democrat line has been anti-Israel for quite a few years and with “representatives” like Omar, Israel’s future is uncertain. “Impeach the mother***ker.” Rashida Tlaib wore the Palestinian flag on election night.. She has not obscured her hatred of Israel and hopes to mechanize the splitting of Israel into a two state hybrid with Palestine. Her praise of Lou Farrakhan and refusal to back away from her anti-sematic posturing shows remarkable arrogance. This entry was posted in History and tagged anti-semetism, Congresspersons, Israel by jackhammerjohn. Bookmark the permalink.